As we near the end of the Bookworm program, we’d like to thank our generous sponsors for helping to make this year’s program a wonderful success! 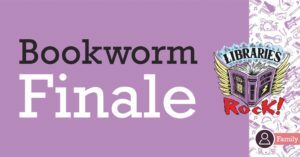 Join us for the Bookworm Finale Party at Yoctangee Park on Thursday, July 26! You read the books, you completed the activities, now come get your trophy and enjoy the best party of the summer! 7:30 to 9:00: Private swim party and snow cones at the Chillicothe City Pool!